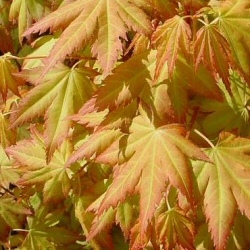 Orange Dream is memorable for its amazing autumn colour and is very similar to Acer Palmatum Katsura. This is quite a sensitive tree and as a result, it , requires a sheltered spot where it is protected from cold winds, in particular those from the north and east. This tree also requires a position where it does not get too much early morning sunshine as its foliage is quite sensitive. Once you have the correct planting position, this tree will not disappoint. Small reddish-purple flowers are followed by typical, red-winged maple seeds. It is autumn where its name Orange Dream is most appropriate, when after the leaves, which have been a yellowy-green colour in summer are now followed by the delicious orange colouring. With its final height of 1.6m (5ft 4in), this tree would be ideal for keeping in a large container on a patio or for planting in a very small garden. This Japanese maple tree is supplied at a height of between 0.6m and 1.2m in a 5.0 to 15L container, which means that the tree has a well-established root system and can be planted any time of the year and with better results than either bare-root or rootballed trees.